BEIJING--(BUSINESS WIRE)--China has taken a global number one position when it comes to investing in renewable energy sources. Digitalization is high on the country’s agenda when it comes to increased efficiency and transformed business models. 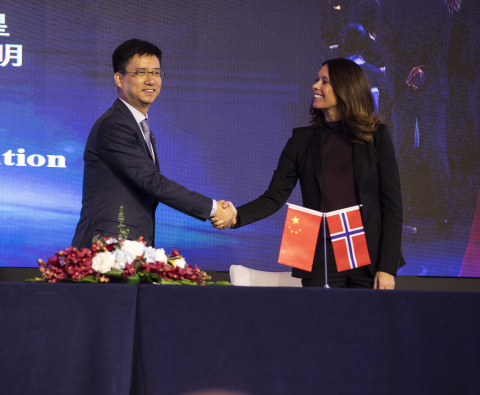 To further promote that development, Kongsberg Digital and Alibaba Cloud, the cloud computing arm of Alibaba Group, have signed a memorandum of understanding (MoU) to explore the opportunities provided by making KONGSBERG’s industrial digital platform, Kognifai, available on Alibaba Cloud’s infrastructure. Operating Kognifai on Alibaba Cloud will make KONGSBERG’s solutions for the energy sector available to a growing market in China and Asia. This includes IoT, advanced and hybrid analytics – available on secure digital ecosystems in which to develop and run scalable mission critical software and applications. Among the specific KONGSBERG solutions that could become available to customers of Alibaba Cloud is EmPower, a suite of efficiency software delivered as a service for the wind power industry. Under the MoU, the companies will start their collaboration immediately and intend to make Kognifai available on Alibaba Cloud in 2019. Established in 2009, Alibaba Cloud (https://www.alibabacloud.com), the cloud computing arm of Alibaba Group, is among the world’s top three IaaS providers according to Gartner, and the largest provider of public cloud services in China, according to IDC. Alibaba Cloud provides a comprehensive suite of cloud computing services to businesses worldwide, including merchants doing business on Alibaba Group marketplaces, start-ups, corporations and government organizations. Alibaba Cloud is the official Cloud Services Partner of the International Olympic Committee. Kongsberg Digital is subsidiary of KONGSBERG (OSE-ticker: KOG), an international, knowledge based group delivering high-technology systems and solutions to clients within the oil and gas industry, subsea, merchant marine, defence and aerospace. KONGSBERG has 7.000 employees located in more than 25 countries, creating a total revenue of NOK 14.5 billion in 2017.